just the hot soup which is sweet , with a fresh aroma of basil from my garden and an occasional kick from the green chillies......i am happy with this soup for one more reason though. writing like this seems like i do not care about my readers , of course i do......i am tremendously encouraged and motivated by all the people who come here and comment , but i'll be honest in admitting that whatever i post here is completely for my own pleasure......i find pleasure here even though there are lots of pains surrounding me.......so it's worth all the more. 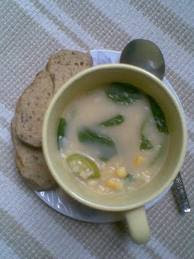 the soup is simple.......a cup of sweet corn kernels, 2 cloves of garlic and a small piece of ginger are processed in a blender, until coarsely ground,and then mixed with 2 cups of water in a pan and simmered on medium flame .......stirring constantly.....add salt n pepper to taste during cooking ( will take about 5 minutes to cook completely) and just when it is half done throw in some torn fresh basil leaves and chopped green chillies .........as much as you want.........i use the bigger green chillies which are less hot n provide a chilly flavor...............let the flavors seep in and pour in you soup bowls to enjoy.........finish with a tsp of fresh cream..stir and enjoy...........i actually kept those bread slices aside ...dint feel like having them...the soup is a standalone enjoyment.........absolutely. for diabetics gluten free healthy meals multigrain/wholegrain quick meals soups for the wt. conscious these foods helped me loose wt. 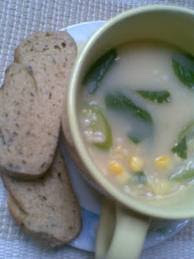 Wow liked adding basil to corn soup..new to me..
Glad to know more about you Sangeeta. Such a delicious and creamy soup looks fantastic...Glad to know more about u Sangeeta..
sounds too good.. lovely presentation!! thanks for trying and telling me. thankyou Sanghi..i'll send it to the event. two od my fav ingredients! slurp! Wonder how you get the time to do all of this ....liked the simple soup and keep up the good work! A lovely healthy soup plenty of aromas yum yum! Congrats for the awards!! And thanks for stopping by at my blog. I answered to your comment on my blog because I haven't your email to do it directly. The soup sounds so good! I love your combination of corn & basil, delicious! hey Yasmeen ...a compliment coming from you is really worth..
Nags....planting basil is really worth as the freshness of you own plant is awesome...i have a basil pot on my windowsill n use that when i need it for dinner as to avoid going out in the garden at night.